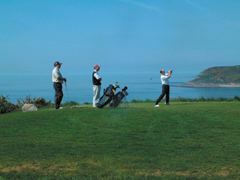 Langland Bay Golf Club was founded in 1904 and has magnificent views of the Gower Peninsula. Although a relatively short course, Langland Bay will present the golfer with a full range of golfing tests. Small greens, plenty of bunkers and punitive rough will dominate your thoughts as you complete your round. The finishing holes are particularly difficult starting with the aptly named "death or glory" 16th.